Common Management Admission Test – CMAT 2019 exam date is January 28, 2019. The CMAT 2019 will be conducted by the newly created testing agency for higher education - The National Testing Agency (NTA) instead of AICTE. The NTA- CMAT will be held in two shifts on Monday January 28, 2019. The first shift of CMAT 2019 exam will be from 9.30 AM to 12.30 PM and the second shift of CMAT 2019 exam is scheduled from 2.30 PM to 5.30 PM. There is no change in the CMAT 2019 exam structure which will have 100 questions equally divided into 4 sections of 25 MCQs each..
Common Management Aptitude Test (CMAT) 2019 is online computer based exam, conducted by AICTE. CMAT 2018 is the official gateway for admissions to the University and AICTE approved MBA/PGDM programmes for 2019-21 batch across the country. CMAT is the only MBA/PGDM exam earlier conducted by AICTE and now by NTA WEF CMAT 2019. No other MBA/PGDM entrance in 2019 is to be conducted by NTA under aegis of AICTE. CMAT is one of the largest National Level MBA/PGDM entrance examination and is conducted once a year in the month of January, as per the directions of Ministry of Human Resource Development (MHRD), Government of India. Universities in 13 states including Uttar Pradesh, Maharashtra, Kerala, Rajasthan, Madhya Pradesh, Gujarat, Haryana, Karnataka among others accept CMAT exam scores alongwith CAT for admission to their MBA programmes. The governments have officially notified CMAT as their official test. In addition, many B-schools offering AICTE approved PGDM programs will be using the CMAT 2019 scores. CMAT scores are accepted by around 400+ B schools running AICTE approved management programmes in India. It is the 2nd largest MBA/PGDM entrance test after CAT in the country. More than 60000 candidates register and apply for CMAT every year. CMAT 2019 is a 3 hour computer based online test which will be conducted in a single session across the country in more than 60 test cities to evaluate the candidate’s ability across various segments like Quantitative Technique, Logical Reasoning, Language Comprehension and General Awareness. The questions are in MCQ format. With effect from 2016 CMAT has become a yearly exam. The CMAT 2019 exam full schedule is made available by NTA now. CMAT is the computer based online exam. Earlier till 2015, there used to be 2 CMAT exams in one year. The first CMAT used to be held in the month of September while the second followed in the month of coming February. CMAT 2019 will be held in 84 test cities across the country on January 28, 2019 in morning and evening shifts. The exam will be held at more than 100 test venues. The CMAT test cities 2019 are spread across the country. The number of CAT 2019 test centres are increased as compared to last year. All the CMAT 2019 test centres have been assigned specific codes so that candidates can instantly know with the code which CMAT test city has been assigned to them. The name of the CMAT test city 2019 allotted to the test taker will be indicated in the CMAT Admit Card along with the test venue. CMAT question papers are the CMAT question bank for the CMAT 2019 exam. CMAT question papers, CMAT 2019 Mock Tests, CMAT Sample papers and CMAT previous question papers help you to understand the right pattern of questions expected in CMAT exam and the strategy to crack it. CMAT Syllabus 2019 for CMAT exam to be held on January 28, 2019 by NTA, contains the expected topics on which questions would be asked in CMAT 2019 exam. The National Testing Agency (NTA) has not changed the CMAT 2019 syllabus or its sectional composition after taking over the CMAT exam from AICTE. To know the overall CMAT 2019 syllabus, you should be aware about the sectional composition of CMAT syllabus and the sectional weightag in CMAT exam. National Testing Agency (NTA) has released CMAT 2019 Admit Card in late evening of January 7. Check details on how to download CMAT 2019 Admit card below. CMAT 2019 admit card download will remain available till January 28. Candidates can print the CMAT 2019 Admit cards from NTA’s website and not from AICTE-CMAT website as NTA is conducting CMAT 2019 on January 28, 2019 in two shifts. How to prepare for CMAT 2019 exam to be held on January 27, 2019, is an important question before the CMAT aspirants. From this year onwards, CMAT will be conducted by NTA and not by AICTE which conducted CMAT till 2018. Since CMAT remains an online computer based test, the exact CMAT past test paper is not available nor anyone is authorized to publish it except NTA, AICTE or MHRd Government of India. However, the National Testing Agency (NTA) has announced that CMAT 2019 will not be much different from CMAT 2018 and earlier CMAT exams. The CMAT 2019 shift-2 has got over at 5.30PM on January 28, 2019. Like the CMAT 2019 Shift-1 exam, the CMAT shift-2 has also remained a moderate exam with slightly tricky reasoning and a bit difficult Verbal. CMAT 2019 overall analysis reveals that the test has remained on predictable lines with moderate difficulty level but slightly more difficult Verbal section and time taking Data Interpretation. GK has focused on current affairs alongwith static facts. The cut offs are not expected to go high. CMAT 2019 is the first CMAT conducted by NTA. CMAT 2019 Shift-1 and Shift-2 Answer keys are live now! The CMAT answer keys and CMAT response sheet with CMAT objection form to challenge the CMAT 2019 answer key is displayed on the CMAT official website from February 1, 2019. The CMAT 2019 answer keys with objection form to challenge the responses in the answer options have been released separately for morning and afternoon slot by National Testing Agency (NTA) which has conducted CMAT 2019 exam in two slots on January 28, 2019. Selection procedure of CMAT 2019 is more governed by the MBA/PGDM admission policy of the individual B-schools. 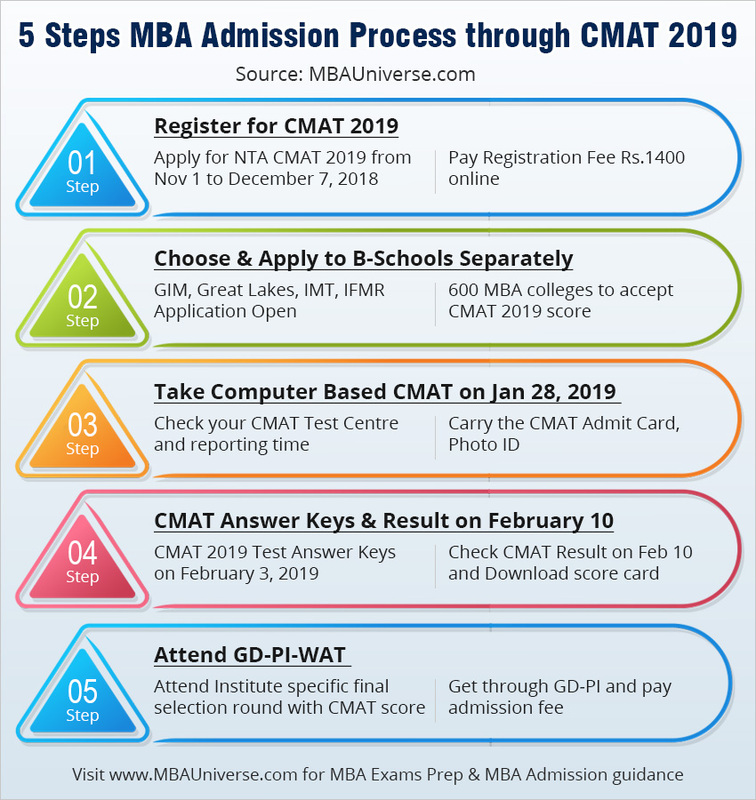 However, the CMAT selection procedure 2019 for MBA admission 2019 will begin only after the CMAT result is declared on February 10, 2019. NTA the CMAT 2019 exam conducting authority will frame the CMAT 2019 selection procedure that includes the CMAT exam process, CMAT Result and disseminating the CMAT individual scores with percentile. CMAT 2019 result with score card is out now. You can download CMAT 2019 score card from official NTA-CMAT 2019 website. CMAT result was declared late evening at 6 PM on February 6, 2019. NTA has released the complete national merit list for the candidates who appeared in CMAT 2019 exam. There were 64.582 candidates who had registered for CMAT 2019 exam. You will be eager to know your CMAT 2019 percentile and the process how to arrive at the accurate CMAT percentile calculation, after taking your CMAT 2019 exam on January 28, 2019. The best CMAT percentile predictor should give you the nearest CMAT percentile calculation so that you may decide whether you would be shortlisted by the top MBA colleges like JBIMS, SIMSREE, GIM, among others for MBA/PGDM admission 2019 based on your CMAT 2019 predictions on your percentile score.